A little piece of me: Another clue! 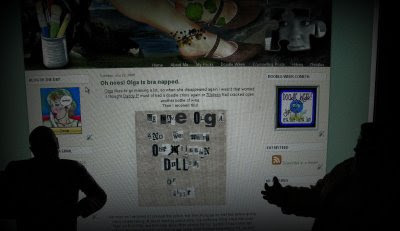 Olga kidnapped by a slaphead? What a perfectly round melon... head that is on the left! Either that's a really big screen, or those are really small people. Is your "My Pictures" slideshow supposed to be giving us more clues? OMG ... you're blog is on a big screen! That's freakier than olga being kidnapped. Claire - Reinforcements are on stand by and The Posse is on HIGH ALERT! Wow! A PowerPoint presentation! These guys are good. OLGA!!!!!!!!!!!!! Claire - Any word yet from those Evil B@$t@rds?!? I have a feeling this may come down to a shootout at the DD Corral! @SandyCarlson, thanks Sandy, normality may resume next week? @haleyhughes, curse you for looking at 'my pictures' ! @Olga, the Traveling Bra, frickin no way. @Random Chick, they are evil geniuses! @70steen, look closely its One Billion Dollars! That's a least a thousand quid. @Daddy Papersurfer, no laughing this is serious! @Olga, the Traveling Bra, gather the fembots! its war.